Today i noticed that the clouds move at some rooms 😮 here is an animation i made of the clouds moving at the beach. 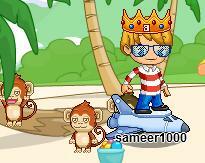 Sorry that the animation is corrupted and is colorful..
Today i noticed that there are monkeys rampaging at the beach. To see for your self you need to click on the tree that is knocked down. Here is an image of the rampaging monkeys.